Marie Wallin runs her own design company complete with website and blog. She also publishes her own books and kits and holds popular creative workshops. Marie works in close collaboration with Rowan where she was Head Designer for Rowan. 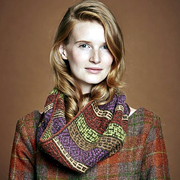 Rowan is the internationally renowned design-led luxury hand-knit yarn company, based in West Yorkshire, England. It is an ethically conscious brand, with an emphasis on creating luxury, premium yarns sourced from organic, natural fibres. During the eight years she was with the Rowan team, Marie built up a global reputation for her beautiful patterns, colourwork and stitch designs as well as her skill for art directing and styling the renowned Rowan magazine and some of the Rowan dedicated yarn brochures. Marie was born in Bolton in 1964 and after a science-based education went on to pursue her first love of art and design by studying a degree in Knitwear Design & Technology at Leicester Polytechnic – now De Montfort University. On graduating with 1st Class BSc Hons in 1986, Marie briefly worked for a small knitwear company in Nottingham before starting her own label in 1988. Under her label she successfully sold hand-knit and machine-knit designs to the US, Japan and several outlets throughout the UK. In 1991 Marie went back to designing knitwear for High Street retailers, such as Next, Burton, BHS and Debenhams. Working for Rowan was a dream come true for Marie, as she has always admired the beautiful yarns and colours. 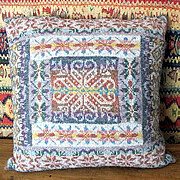 "I get very inspired by seeing beautiful textiles and crafts, especially from North Africa, South America and India. I love to put colour together to create interesting fabric designs in both knitting and crochet. Working with Rowan has given me the opportunity to develop my love of colour and pattern and to create beautiful knitwear that I hope everyone will love to wear". Marie has not yet finalised the two special projects she will bring to work on in 2019, but they will be similar to 2018, probably with a Fairisle project and a new stitch to try. 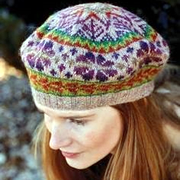 The pictures show some of her wonderful designs: a cushion, a fairisle tam and a mosaic cowl. As well as knitting sessions at the mill, we'll also be working at a privately owned ex- monastery and in the grounds of a fabulous hill-top restaurant.